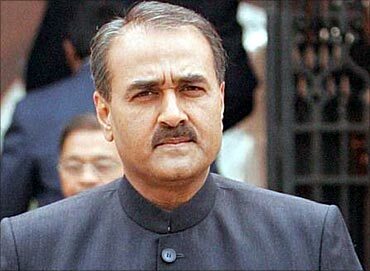 Terming the Mumbai blasts as an attack on India's economic growth, Union Minister and Nationalist Congress Party leader Praful Patel on Thursday said the Centre and state governments should set up a specialised force to deal with such situations in big cities. Patel also agreed with Congress leader Rahul Gandhi's remarks that it is not possible to keep a check on all such incidents due to the size of the city, but said that such a situation should not become a "permanent disability". 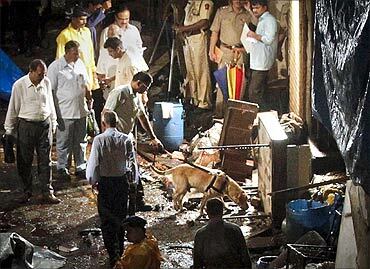 Image: Police use a sniffer dog at the site of an explosion in the Zaveri Bazaar. "There are slums and other such areas in big metros which make the work of police and security agencies difficult. But this cannot become a permanent disability. The Centre and the state government will have to find ways and means including setting up of a specialised force to check repeat of such incidents in big cities," he said. The minister for heavy industries and public enterprises also said that such attacks send out a 'wrong signal' as it is an attack on India's 'economic growth and might'. He said since 1993, Mumbai has been targeted by terrorists every two-three years because it is the economic capital of the country. 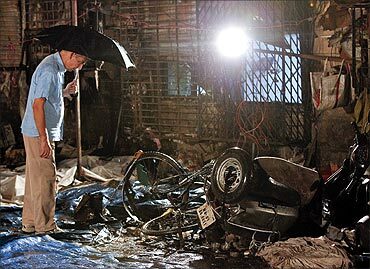 The serial blasts in Mumbai were not aimed at un-nerving the business centres of the financial capital of the country but were targeted to hit the congested and populated areas, Home Minister P Chidambaram said on Thursday. "I don't think the blasts can be interpreted to be an attack on markets. Blasts have taken place in Dadar, in Opera...are bizarre. I think they chose the places because of the density of the population and very congested nature of these areas." Image: A policeman surveys the aftermath at the site of an explosion near the Opera House in Mumbai. "I don't think it should be treated as an attack on India's commercial capital as I said last attack was on 26/11, this attack after 31 months is regrettable. I want to assure that India will continue to prosper...this cannot be seen as an attack on India's commercial capital," he told reporters in Mumbai. 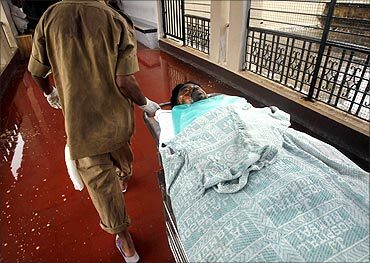 Image: A man, injured by an explosion on Wednesday, is moved to the hospital. Meanwhile, the stock markets here began their business on a normal note. "I walked on these lanes yesterday and it was the nature of the construction there...the kind of work that goes on there the density of the population was quite mind-boggling. 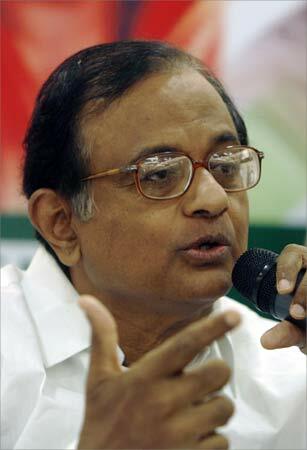 I think they chose places where even a low intensity blast would have a great impact," Chidambaram said. 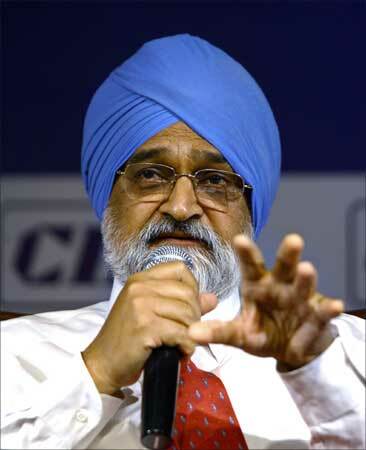 Terming the Mumbai serial blasts as an act of terror, Planning Commission Deputy Chairman Montek Singh Ahluwalia said on Friday that the tragic event should not impact sentiments at the capital market. "I don't think these things impact investors' sentiment directly," he told reporters in New Delgi. 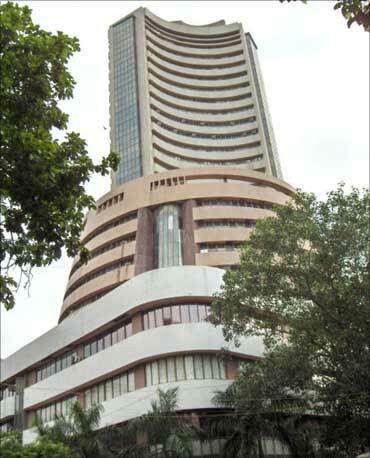 The BSE benchmark Sensex opened 145 points lower on Thursday in the wake of investor worries following Wednesday's serial bomb blasts in the country's financial capital, amid a weakening overseas trend. However, the market pared initial losses as the day progressed. Ahluwalia said people perceive such events as acts of terrorism and the government was taking all necessary steps to reduce the danger of such events. "But I don't think investors' sentiment is what you should look at. The real concern is the issue of loss of life," he added. Earlier in the day, while talking to reporters in Mumbai, Home Minister P Chidambaram too had said the Wednesday's blasts were not aimed at un-nerving the business centres of the financial capital of the country but were targeted to hit the congested and populated areas. The bomb blast at India's largest diamond trading hub in Mumbai has rattled traders and businessmen. 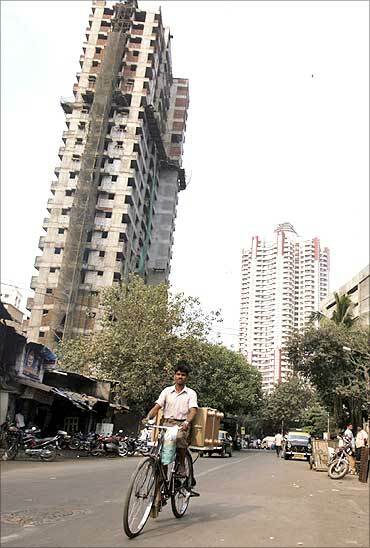 Diamond traders say Mumbai's bustling business hub at Opera hub has been targeted to destabilise the economy. A report in the DNA newspaper quoting Pravin Nanavati, former president of the Surat Diamond Association, said diamond sales will be hit as foreign buyers will be wary of travelling to Mumbai. 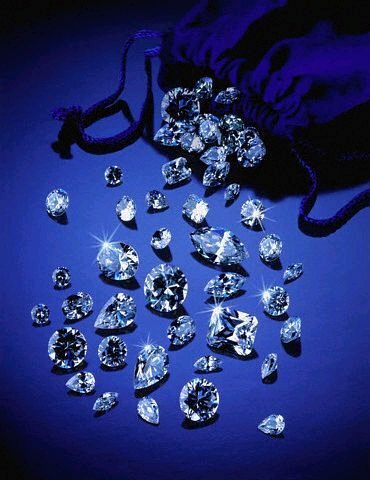 The import and export of diamonds are handled by diamond hub at Opera House, which has around 6,000 diamond traders. Zaveri Bazaar, which is a hub of jewellery shops was also targeted by terrorists. 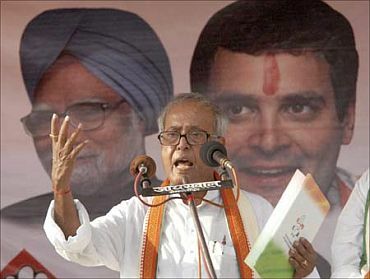 Condemning the Mumbai terror attack, Finance Minister Pranab Mukherjee on Thursday said such cowardly acts cannot impact India's march towards a robust economic growth. "(I am) fully confident that our economy and markets will rise above this incident and continue to show robust growth," Mukherjee said in a statement. Expressing deep sorrow over the loss of innocent lives and the sufferings of those who have been injured, the minister said he "shares the pain and agony of their friends and families". Like in past, he added, Mumbaikars would once again show strong courage to face the challenge thrown by the "cowardly terrorist attack". "...the indomitable spirit of Mumbai, the financial capital of India, as always in the past, would once again respond with courage and renewed vigour to such challenges," he said. India, which is one of the fastest growing economies in the world, is likely to clock GDP expansion of about 8.5 per cent this fiscal. Experts said that markets have time and again shown that such terror strikes would not have any material impact, as they cannot dent the general functioning of the economy. The country's two main bourses -- the Bombay Stock Exchange and the National Stock Exchange -- opened at their scheduled time and undertook normal business activities. Now, a language test for computers!